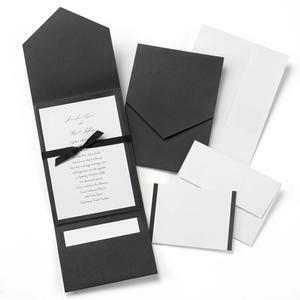 10719 - White invitations with classic black pocket and black, 3/8" satin ribbon. 5 1/8" x 7 1/4". Coordinating R.S.V.P. cards, 4 7/8" x 3 1/2". Comes 2-up and perforated. Foam adhesive dots included. The R.S.V.P. tucks into the bottom slot. Pocket is folded and inserted into a white mailing envelope. Package of 25.